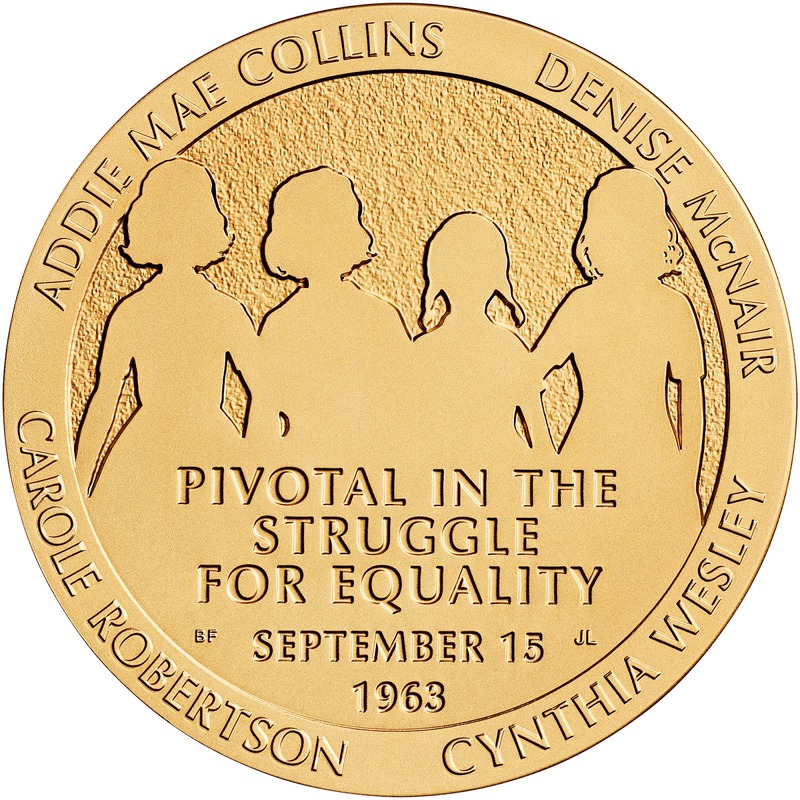 Earlier this week, a Congressional Gold Medal was awarded posthumously to Addie Mae Collins, Denise McNair, Carole Robertson, and Cynthia Wesley. They were the four young black girls who lost their lives in the bombing of the 16th Street Baptist Church in Birmingham, Alabama on September 15, 1963. The ceremony was held at the U.S. Capitol Building. The senseless, premature deaths of these young girls as they prepared for Sunday school galvanized the civil rights movement and sparked a surge of momentum that helped secure the enactment of both the Civil Rights Act of 1964 and the Voting Rights Act of 1965. The 16th Street Baptist Church remains a powerful symbol of the movement for civil and human rights, and the ultimate sacrifices made by these girls are emblematic of many others who have lost their lives for the causes of freedom and equality. The United States Mint struck and prepared the Congressional Gold Medal as authorized by Public Law 113-11. 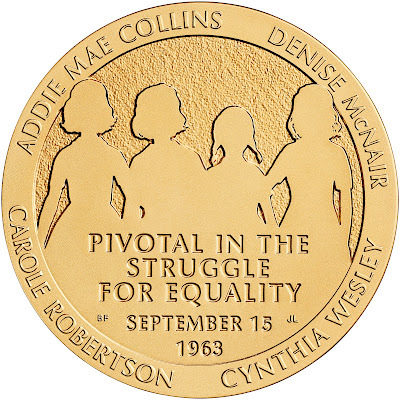 The medal's obverse (heads side) was designed by United States Mint Artistic Infusion Program (AIP) Master Designer Barbara Fox and sculpted by United States Mint Sculptor-Engraver Jim Licaretz. The design features the silhouette of four young girls, representing those killed on that fateful day. The victims' names are inscribed around the border of the design, with the quote, "Pivotal in the struggle for equality." Additional inscriptions include "September 15" and "1963," which are incised across the silhouettes. The medal's reverse (tails side) was designed by AIP Master Designer Donna Weaver and sculpted by Sculptor-Engraver Joseph Menna. The design depicts a view of the 16th Street Baptist Church with the quote, "Killed in the bombing of the 16th St. Baptist Church" to the left of the image. Additional inscriptions are "Act of Congress 2013" and "Birmingham, Alabama." The public law that authorized the United States Mint to strike the Congressional Gold Medal also authorizes the bureau to strike and sell three-inch and 1½-inch bronze replicas. These medals are currently available for purchase at the bureau's online catalog, http://www.usmint.gov/catalog. The medals also can be purchased by calling 1-800-USA-MINT (872-6468). Hearing- and speech-impaired customers with TTY equipment may call 1-888-321-MINT (6468). The three-inch medals are priced at $39.95 each and the 1½-inch medals are priced at $6.95 each. The United States Mint was created by Congress in 1792 and became part of the Department of the Treasury in 1873. It is the Nation's sole manufacturer of legal tender coinage and is responsible for producing circulating coinage for the Nation to conduct its trade and commerce. The United States Mint also produces numismatic products, including proof, uncirculated, and commemorative coins; Congressional Gold Medals; and silver and gold bullion coins. The United States Mint's numismatic programs are self-sustaining and operate at no cost to the taxpayer. Publisher's Note: The Friday Focus series seeks to highlight interesting stories, in my opinion, simply have not gotten as much attention in the news media as they deserve.